Over the last decade, the Slovak Republic has established itself as a provider of development co operation. Slovakia more than tripled its volume of official development assistance (ODA) between 2004 and ‌2008. In 2012, its ODA reached USD 80 million, or 0.09% of the country’s gross national income (GNI). The Slovak Republic has also developed legislative and strategic frameworks as well as monitoring and evaluation systems for providing effective development co-operation. At its meeting on 17 September 2013, the DAC invited the Slovak Republic to become a member of the Committee. The Slovak Republic accepted this invitation and, in a letter addressed to the OECD Secretary General, pledged to fulfil obligations of DAC membership. 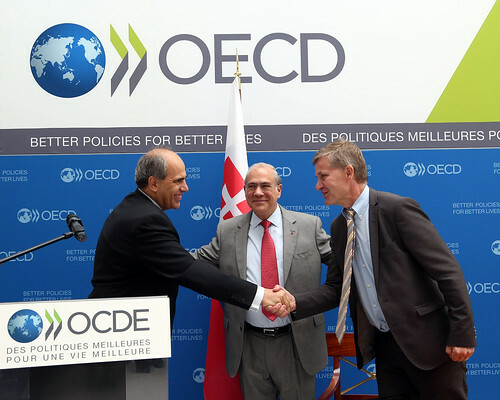 Peter Burian, State Secretary at the Slovak Republic’s Ministry of Foreign and European Affairs, Angel Gurría, OECD Secretary-General and DAC Chair Erik Solheim. Slovakia focuses its bilateral development co-operation on three programme countries (Afghanistan, Kenya and South Sudan) as well as on several project countries in Western Balkans (Former Yugoslav Republic of Macedonia, Montenegro and Serbia), Eastern Europe (Belarus, Georgia, Moldova and Ukraine) and Africa (Tunisia), with which it shares its transition experience. The Ministry of Foreign and European Affairs has overall responsibility for formulating Slovak development co-operation policy and for co-ordinating aid activities. Reform of the management of public finances is widely recognised as one of the most successful areas of the economic transition in Slovakia. Public financial management is also a priority sector in the country’s ODA strategy. Therefore, the Ministry of Finance of the Slovak Republic, together with the UNDP Bratislava Regional Centre, have designed and implemented the programme “Public Finance for Development: Strengthening Public Finance Capacities in the Western Balkans and Commonwealth of Independent States”. This five-year programme, which started in June 2009, is financed by the Ministry of Finance within the Slovakia’s development co-operation programme and has a budget of nearly USD 2 million.